You can change existing email contacts to add new information plus other fields, or delete a contact. Scroll down to the Contacts panel and click Manage your contacts. Choose the contact you want to change and click Edit. Note: To remove a contact, click in that row and click the Delete button. 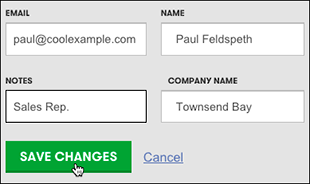 Type in any field to change its contents, or click Add another field to do exactly that by typing in a new name and clicking Add. Note: Enter your information once the new field appears. Added fields are only visible when you're editing a contact. They are hidden when you're in list view. Click Save Changes, and you will return to the contact list view. See Create Email Campaign to send your contacts sales alerts or other promotional information. Create Contacts to manually expand your email list. Collect Email Subscribers so that site visitors can submit their email addresses. How long does a Facelift redesign take? Email 101: What is an email client?